The bases for this contest are also in Spanish. You can read them here. From GAOMON & THE ART BOND comes a contest in which participants will be asked to design a mascot character and its companion with the first prize being a Pen Display Tablet, PD1560. Besides the main contest, you can also take part in the raffle of an M106K. [Link to the raffle: http://bit.ly/gaomoncontest]. The intention of the contest is the search for two characters, which will become the mascots of GAOMON (2018-2019). One of these characters is meant to be more complex than the other. Both characters must be related to each other and be friends. Participants won’t be asked for finished drawings. Instead, they’ll be asked for drawings that properly show the ideas and concepts of both characters, with optional descriptions and notes of them. Once the deadline is over, the winner will be announced 14 days afterward. The winner will be the only one to be asked for a definitive version of both characters. GAOMON will use these characters for advertisement purposes only. If GAOMON wished to sell products derived from these characters (such as merchandising of them), GAOMON would have to reach an agreement with the winner. Hypothetically, the design of the characters should allow the creation of merchandising from it. Such as keychains, stuffed toys for the simpler character, etc. Once the winner sends GAOMON the definitive version of the characters, GAOMON will send them back the prize. The delivery period of the contest starts from today, the day of its announcement, until 30/11/2018. Deliveries will be possible for the entirety of that last day as well. After the deadline, in accordance with the Greenwich Mean Time, A.K.A. UTC (Coordinated Universal Time), deliveries will no longer be possible. https://time.is/UTC. Winners will be announced 14 days after the deadline, that is, the 14/12/2018, via Twitter, in @GAOMONpentablet and in @TheArtBond. Demonstration picture of two characters who should be partners and friends. One has a more complex design than the other. The idea of the contest is to find a couple of characters. One has a more complex design than the other one, which is simpler. Together, they must reflect the image of the company in a refreshing way. Both characters can be humanoid or not. The gender of both characters is up to the artist to decide. At least one of them must have a simple design. Both characters must be related to each other and be friends. We recommend you to look for inspiration in the logo of the company, as well as its website, products, etc. This is one of my entries for GAOMON’s Mascot contest! #GAOMONMascot #CharacterDesign #Contest #Drawing #Raffle @Gaomonpentablet @TheArtBond. “Full version of my work: YourOptionalURL.com” is an OPTIONAL code: you can add links to see the full drawing, the full drawing with the character descriptions, comments of your own, etc. You can add from 1 to 4 pictures in the tweet + your OPTIONAL URL. It’s essential that, through the material given by the participants, we may understand how those characters are. You can add written notes, descriptions. However, these are not mandatory. 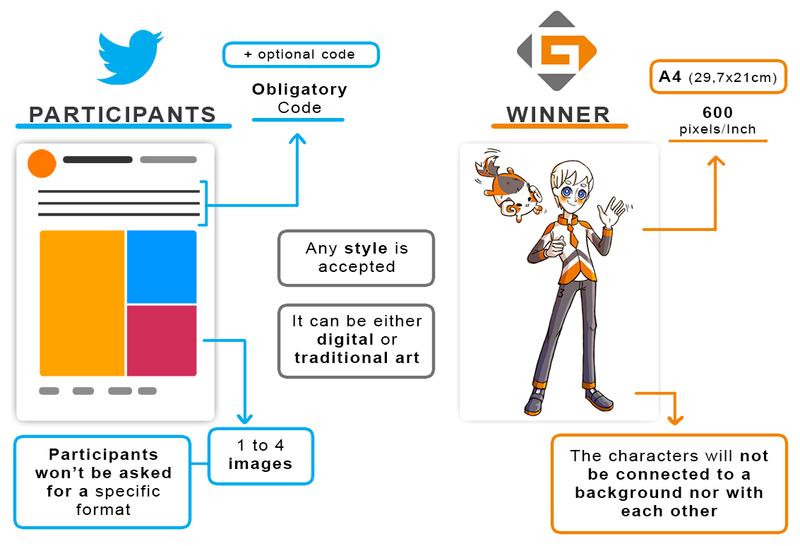 If the picture by its own reflects well the personalities of both characters, and the designs overall can be understood without annotations, the participant’s entry will be completely valid. This picture contains just a fraction of the essential information required to participate. Please read all the bases to fully understand them. PARTICIPANTS WON’T BE ASKED FOR A SPECIFIC FORMAT. Please, choose a visually pleasing format of your choice. It can be presented in either digital or traditional art (photographed or scanned). Those pictures are just random examples of drawing formats forms you can choose. Remember, participants won’t be asked for a specific format: select any visually pleasing format of your choice. Only the winner will be asked for a finished version of the characters. Format: A4 (21×29,7) centimeters. 600 pixels/Inch. The characters will not be connected to a background nor with each other. We recommend the finished version to be in .PSD or .PNG formats. If this format is chosen, please upload your work via Twitter in a smaller format. It can be presented in either digital or traditional art (scanned). The number of deliveries: You can send as many designs as you like, with all the tweets you need. However, that won’t affect the final outcome. The artwork must be original. Copied pictures are not allowed. Don’t use characters with copyright. Don’t use designs based on characters from other people. Any sensitive content is not allowed. You must be at least 14 years old to participate. If you’re under the designated age and you still wish to participate, you’ll need a written permit from your parents or legal tutors. To go through this process, you can contact us through @TheArtBond on Twitter. 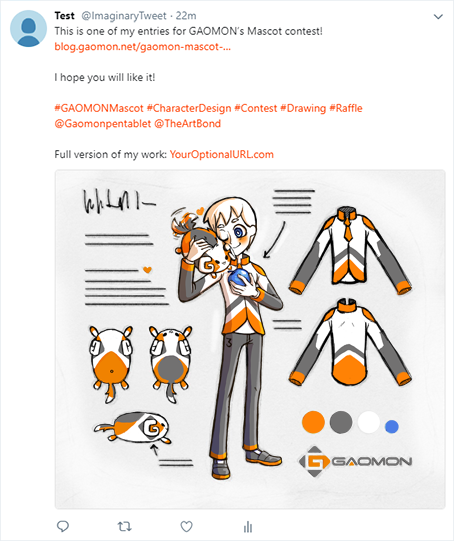 GAOMON authorizes THE ART BOND to answer questions about the contest through Twitter in its account by a private message. THE ART BOND cannot give an opinion about your works. It will only answer any doubts referring to the event. When taking part in this contest you agree with GAOMON & THE ART BOND being able to share your work, for non-commercial purposes only. For example: if GAOMON & THE ART BOND were to compile your work in their websites, they will be shown with links to your original entries. The characters will remain yours. However, by basing your work in GAOMON you’ll not use these characters in a way that may harm the image of the company. For example: drawing these characters in a way that may be considered as sensitive content. If you as a participant (not a winner) wished to use your characters for commercial purposes, please remove any evidence of them being based in GAOMON, and redesign them so that characters are completely disassociated with the characters presented in this contest. For example: removing the logo of the company if it was included in the design, changing details, colors, etc. By winning the contest, your characters will now belong to you and GAOMON. GAOMON promises not to use the characters for commercial purposes, only for advertisement unless any other agreement is reached with the winner. For example: if GAOMON wished to add these characters in their business cards, in their websites, brochures, posts, picture books and leaflets for advertising and promotion purpose; in the packaging of their products, on print media and digital media product package for public display; also on printed materials at exhibition booths or retail outlets etc, they would be allowed to do so because they are not selling the characters nor any product derived from themselves, they’d be used for promotional purposes only. If there was a wish to directly use the characters for commercial purposes (making sellable products derived from them) GAOMON and the winner shall reach an agreement to set up percentages, royalties and other clauses that will have to be accepted by both sides in order to make it happen. GAOMON reserves its right to commission a drawing of the characters to another artist, not necessarily to the winner, for promotional use only, once again. To make a commercial use of the characters it will have to do so after reaching an agreement with the aforementioned winner as we previously stated. GAOMON reserves its right to use or not to use the winner work for promotional ends. GAOMON commits itself to send both the prize of the contest and the prize of the raffle to the respective winners. GAOMON & THE ART BOND reserve their right to broaden the deadline given any unexpected event. GAOMON & THE ART BOND reserve their right to alter the bases during the contest only to remove any mistakes, expand its information, etc. They will never eliminate information from the established bases. Any significant change will be announced through Twitter, and both the time and aspects of these will be indicated at the beginning of the bases. GAOMON & THE ART BOND reserve their right to disqualify any participant who has broken any rules of the contest, alter the proper development of the event, etc. The winner of the raffle will be announced right after the winner of the contest. It’s mandatory to follow @Gaomonpentablet and @TheArtBond on Twitter, and share the link of the contest (Retweet). You can participate in with a maximum of two accounts, and both have to be active and belong to you. The prize will only be given to accounts that resemble any activity. It won’t be given to accounts without an avatar, description, activity, etc. Please don’t use private accounts to participate. The 72hs established after the announcement of the winners on Twitter will allow people to know the winners and check if they do not comply with any rules stated in the contest bases. If GAOMON & THE ART BOND find out and confirm that any of the winners do not follow the bases of the contest, the status of ‘winner’ will be removed from them. We hope you enjoy this event as much as we do. Give us your best! You can do it!